Arms control isn’t perfect. But abandoning treaties without a plan for the future is dangerous. Every American president from John F. Kennedy to Barack Obama has successfully negotiated an agreement with the Soviet Union, or the Russian federation, to reduce the threat from both countries’ vast nuclear arsenals. More than a dozen treaties limiting nuclear testing, nuclear weapons, activities in outer space and missile defense have been part of this mix. Santa Fe, NM – As the annual state legislative session begins, New Mexico is faced with a ~$70 million budget deficit, which must be balanced as per the state’s constitution, while revenues are projected to continue falling. To remedy this, Gov. Martinez plans to divert $120 million from public school reserves, take ~$12.5 million out of state employee retirement accounts, make teachers and state workers pay more into their retirement accounts (they are already among the lowest paid in the country), and extend 5.5% cuts for most state agencies while cutting yet more from the legislature and higher education. Instead, the state’s budget deficit could have been prevented had the New Mexico Environment Department aggressively fined polluters. But unfortunately there is a strong revolving door between NMED and the polluters it is suppose to regulate. In her 2012 State of the State speech Gov. Martinez said, “My appointees are barred from lobbying state government for 2 years after serving in my administration.” Yet in August 2016 the Secretary of the New Mexico Environment Department (NMED), Mr. Ryan Flynn, resigned to become the Executive Director of the New Mexico Oil and Gas Association, whose main purpose is to lobby on behalf of the oil and gas industry against environmental regulations. Before joining NMED, Mr. Flynn worked for a law firm that advertises that “Our representation of oil and gas producers, mid-stream entities, and natural gas pipelines has been a mainstay of Modrall Sperling’s natural resources practice since the early days of the firm.” Modrall Sperling lawyers were very active in the NM Oil and Gas Association’s opposition to the so-called “pit rule” that sought to prevent oil and gas drilling mud waste from leaching into and contaminating groundwater. In June 2013 the New Mexico Oil Conservation Commission, appointed by Gov. Martinez, eviscerated the pit rule. Similarly, Martinez and Flynn promulgated new groundwater protection rules that for the first time in the country actually allows groundwater contamination if it doesn’t migrate past the footprint of the operating site. This is the so-called Copper Rule, drafted by the copper mining giant Freeport-McMoRan (which is also a Modrell Sperling law firm client). On January 13, 2017 Kathryn Roberts, the head of NMED’s Resource Protection Division, announced that she was leaving the Environment Department to accept an unnamed job in Alamogordo. Before NMED she worked at the Los Alamos National Laboratory (LANL) for four years as Group Leader for Regulatory Support and Performance (of “cleanup”). Upon information and belief, she will work as a public communications specialist for Longenecker and Associates, a Department of Energy (DOE) contractor that proposes to drill deep boreholes to test the disposal of high-level nuclear waste near Alamogordo. This is part of the continuing targeting of New Mexico as the nation’s nuclear waste dump. Longenecker and Associates have participated in Sandia Labs studies of deep borehole high-level waste disposal. Of interest are some relatively recent new hires by Longenecker, including Don Cook, a longtime Sandia Labs scientist, past manager of the Atomic Weapons Establishment in the United Kingdom, and most recently the Deputy Administrator for Defense Programs (i.e., nuclear weapons) at the National Nuclear Security Administration. As such, he was essentially the head of the U.S. nuclear weapons complex, including the Los Alamos and Sandia Labs. Also new to Longenecker and Associates as Corporate Vice President and Chief Strategy Officer is Christine Gelles, former interim manager of the new DOE Environmental Management field office at Los Alamos. A Longenecker resume´ notes that Gelles “Led planning and initial regulatory interactions with New Mexico Environment Department negotiation of Los Alamos Consent Order.” Ms. Roberts would have been one of Gelles’ counterparts on the other side of the table as head of NMED’s Resource Protection Division. An original 2005 Consent Order negotiated between NMED and DOE was meant to compel comprehensive cleanup at LANL and force the Energy Department to increase cleanup funding. The new Consent Order, likely negotiated at least in part between Gelles and Roberts, contains giant loopholes whereby DOE can get out of cleanup by simply claiming that is too difficult or too costly. In fact, since the new Consent Order went into effect in June 2016, DOE has announced that the cost of “Remaining Legacy Cleanup” of radioactive and toxic wastes from more than 70 years of nuclear weapons research and production at LANL will cost $2.9 to $3.8 billion through fiscal year 2035, averaging $153 million per year, which is ridiculously low. That cost estimate clearly assumes that the Lab’s major radioactive and toxic wastes dumps will not be cleaned up. Instead they will be “capped and covered,” leaving some 200,000 cubic yards of radioactive and toxic wastes at Area G, its largest waste dump, posing a permanent threat to groundwater. DOE’s cost estimate for future LANL cleanup assumes flat funding out to FY 2035, and notes how that cost is “Aligned to [the] 2016 Consent Order.” This is a distinct and very unfortunate break from the 2005 Consent Order. Particularly galling is the fact that under Gov. Martinez and ex-Secretary Ryan Flynn the New Mexico Environment Department granted more than 150 milestone extensions to the 2005 Consent Order, and then turned around and said that the Consent Order wasn’t working. From a budget perspective, New Mexico could have collected more than $300 million in stipulated penalties, more than four times the state’s projected budget deficit, had NMED vigorously enforced the 2005 Consent Order. All of this is part of a pattern where the Martinez Administration has coddled the nuclear weapons industry even as that industry is cutting cleanup funding and ramping up nuclear weapons production that caused the mess to begin with. Gov. Martinez and ex-NMED Secretary Ryan Flynn have touted what they call an historic $74 million settlement that New Mexico and DOE reached after a radioactive waste barrel that LANL improperly treated ruptured at the Waste Isolation Pilot Plant (WIPP), contaminating 21 workers and closing down that multi-billion dollar facility for nearly three years. What was left unsaid is that DOE was already responsible for the supermajority of “Special Environmental Projects” that were agreed to in lieu of penalties and fines that could helped solved New Mexico’s budgets woes, even though state and federal policy on those projects both require that the regulatory agency collect a significant monetary penalty. 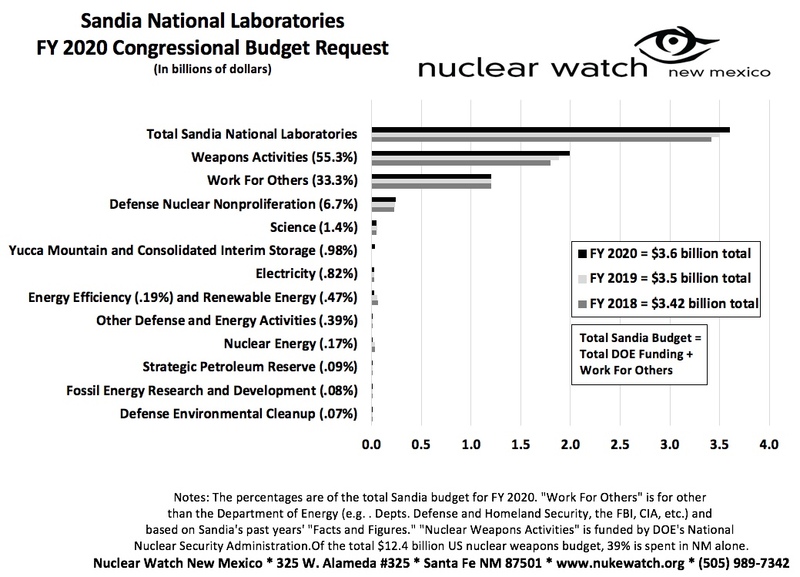 Not one penny went to New Mexico, while DOE was “obliged” to, for example, repave roads at WIPP and LANL that it uses to transport the radioactive bomb waste that it produces. To add insult to injury, NMED agreed to waive penalties for all future, unknown violations – no matter the severity or length – as long as there is corrective action of any sort at some undefined time. Also included in this give-away was an obligation by NMED to negotiate modifications to the 2005 Consent Order (now completed to New Mexico’s disadvantage), and to forego penalties that could have been assessed against DOE under it. As the annual state legislative session begins, New Mexico is faced with a ~$70 million budget deficit, which must be balanced as per the state’s constitution, while revenues are projected to continue falling. To remedy this, Gov. Martinez plans to divert $120 million from public school reserves, take ~$12.5 million out of state employee retirement accounts, make teachers and state workers pay more into their retirement accounts (they are already among the lowest paid in the country), and extend 5.5% cuts for most state agencies while cutting yet more from the legislature and higher education. Instead, the state’s budget deficit could have been prevented had the New Mexico Environment Department aggressively fined polluters. But unfortunately there is a strong revolving door between NMED and the polluters it is suppose to regulate. 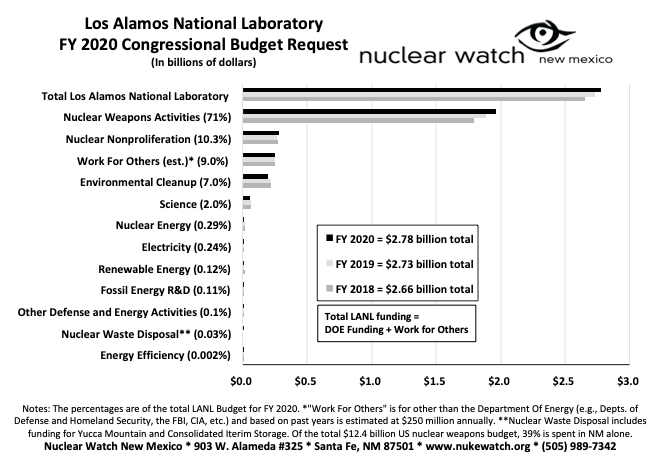 The Department of Energy (DOE) has released a 2016 Lifecycle Cost Estimate Summary of proposed future cleanup at the Los Alamos National Laboratory (LANL). At the beginning of that document, DOE declares that “An estimated 5,000 cubic meters of legacy waste remains, of which approximately 2,400 cm [cubic meters] is retrievably stored below ground”, a claim which was widely reported in New Mexican media. From there DOE estimates that it will cost $2.9 to $3.8 billion to complete so-called cleanup around 2040.